This is a well-researched work, including oral history from people still alive. It is full of bizarre people like the Yugoslavian prince who liked pop music and who later has to be kept way from prostitutes, the mad king who kills his servant by trying to shoot a cigarette out of his mouth, eats rats and puts broken glass all over school playground. 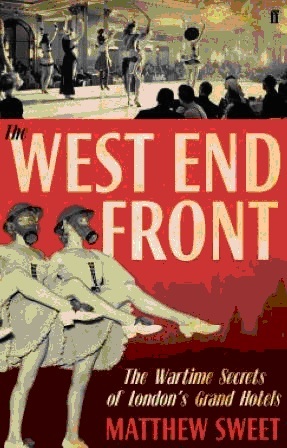 The book begins with a lyrical description of the evening before World War was declared: newspapers carry normal news, cafes opened late in Soho, London’s West End was brighter that night than it would be for a decade, there was an advert. for a TV set which is doomed to go dark the following lunchtime, as history clicks back to 1914. One of the most graphic descriptions is of a smoke from a factory fire after it was bombed – rum and sugar make for some colour. Despite Somerset Maugham predicting that social class divisions would end as a result of the war, the only change for hotels was the end of the top hat and frock coat. They would rather have real aristocracy who couldn’t pay than nouveau riche who could. Dowager duchesses are two a penny. ‘Some are born to be served, others to serve.’ Staff worked long hours with no payment other than tips until the tronc system was introduced, in which tips are collected and later shared out between all staff. Hotels supported subcultures: aristocrats, journalists, actors, criminals, spies, homosexuals. Like the Windmill Theatre, they never closed during the war. Hitler can’t disrupt cocktail hour. You could pretend there wasn’t a war going on. Owing to sound insulation a band played all clear. There are some things that war did not change. Bureaucrats ordered more burial forms for the stationery cupboards, and bribing the police with gifts to its charity was already happening. Homosexuals were subject to entrapment as if the police had no real crimes to solve. The rich got acquitted by character references, though their gifts to poorer men were used as court exhibits. The BBC was a haven for discharged gays (not, as Oswald Mosley claimed, for Jews.) There were more court martials for homosexuals than for anything else, though the Navy more tolerant that army (and many gay men chose navy because they looked good in blue.) The Dilly meat rack was there all that time ago and men who liked cottaging or simple had a prostate problem bewailed the closure of gents’ toilets. Homosexuality was a leveller of social class. It was accepted by working and upper classes but not the ‘ugly middle classes. Now, it is almost compulsory to be middle class, though ‘take a local boy to your bed but never, never to the table’. One Roman Catholic, because divorce was forbidden, still lived with his wife although he was in love with his butler. I have discovered the origin of by earliest sense of injustice. Public schoolboys had to eat all sweets on the day of purchase. A stash could lead to expulsion. When I was hospitalised at age eight, my mother brought me some sweets. The nurses took them away and shared them with all the other kids on the ward. So that’s why people call the NHS an experiment in socialism.